First, we learned about the Element of COLOR and explored Color Schemes (Primary, Secondary, Tertiary, Monochromatic, Complimentary, Analogous...). Students took notes, then cut out little examples I printed for them, and arranged them with their notes (corresponding color schemes). 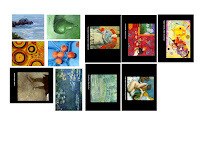 We reviewed as a class and glued in the little images. They seemed to really enjoy this part. Then, students completed the "I Can!" 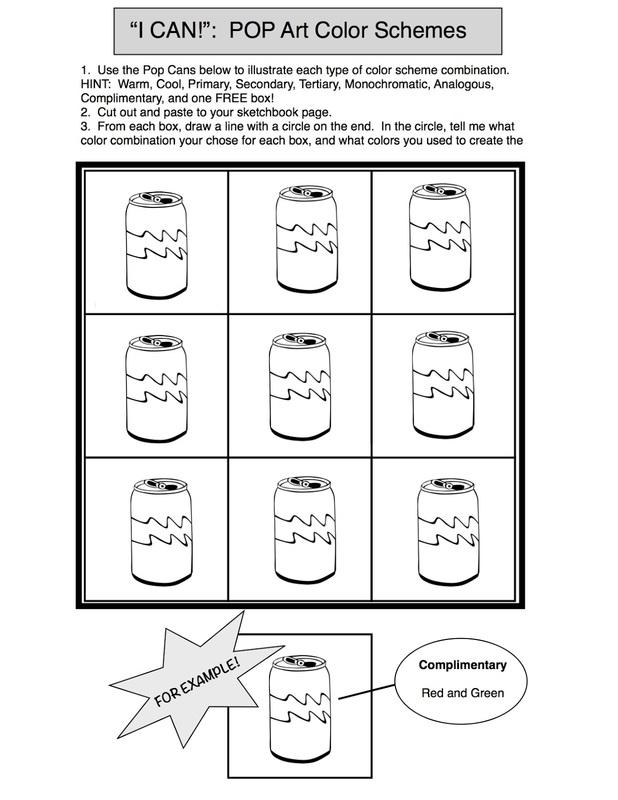 Pop Can Color Scheme handout. I used this one from last year, when our unit used Pop Art as inspiration. This year, I ran out of time, so it didn't seem AS relevant as I normally would have liked. For this project, I might modify the pop cans to be Mondrian inspired pieces (or Frank Lloyd Wright even? ), for example, which gets them to start thinking of designs for their pillow project. We then did a quick overview of the Element of Texture, discussing physical and visual texture. I would have liked to come up with a handout for this. 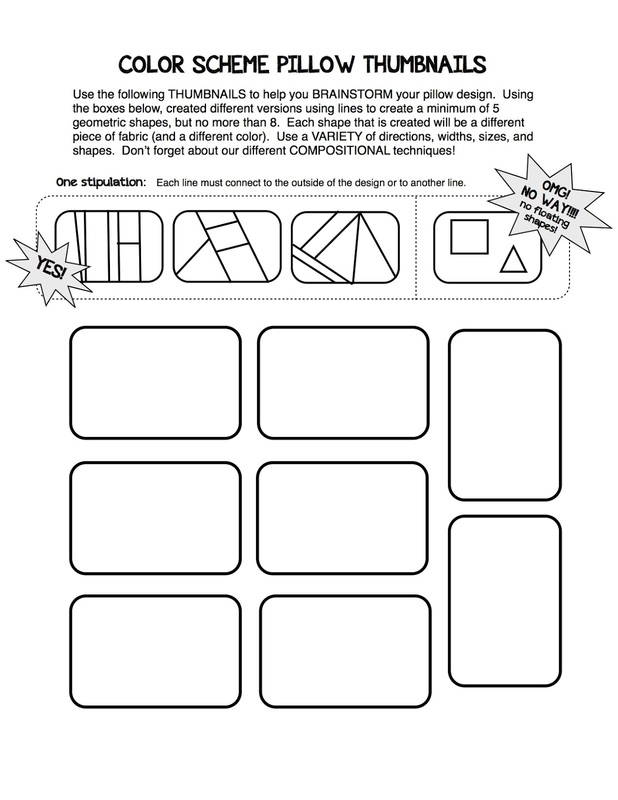 The students did practice creating visual texture in their sketchbooks using this hand handout we have (I'll try to post that later). Last year, we did a mini physical texture project in which groups of students covered mundane objects in a different texture, transforming the surface of the object. I just didn't have time this year. another line, creating an odd negative space. I knew that this was a fairly complicated project to begin with, so I wanted to keep the strips of fabric as simple as possible. Once they came up with the designs, they used color pencils to color each thumbnail with the SAME color scheme AND colors that they chose. For example, if they chose monochromatic, then they should choose one color and color each thumbnail using various shades of that one color. I realized that I was not as clear as I would have liked to have been with this step. Next time, I might make them fill out a bellringer or something like that in which they tell me which color scheme and colors they would like to use for their pillow. That way, they would be clear on the expectations BEFORE coloring the thumbnails. Once they completed that, the students showed me their favorite design for approval. 1. 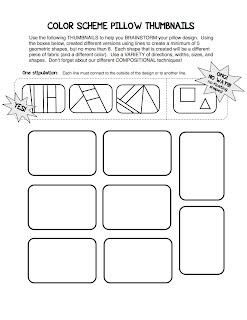 Take a Template Handout and redraw your design in this larger scale. Then, use your color pencils to color the design like your approved thumbnail. 2. 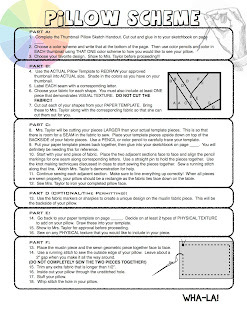 Label each of your seams per the instructions. *I purchased fabric through my own money for this project. I went online and through Amazon.com found some great fabric options that had tons of patterned quilting swatches using specific color patterns. This was great because I could choose which patterns and color. 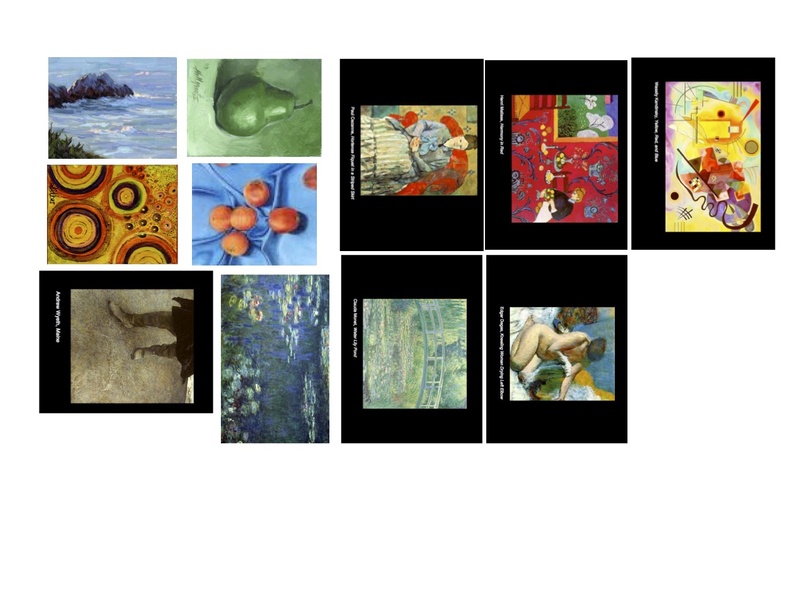 The downside is that they come in small squares, so students can't use those for all of their pieces (some pieces are larger than the small squares). I also provided them with different physically textured felts, or plain felt which come in 8x10 sheets. Also, I was able to get long skinny swatches, which also helped for some of the longer straight pieces. OH! I also gave students extra credit if they brought in old t-shirts or other types of fabrics to use for this project. I was shocked by the amount of clothes students brought in. This was perfect because these all had different physical and visual textures, colors, and interesting words, too. 4. Before I could cut out their fabric pieces, I had the students then cut out their paper template pieces. Students brought me their pieces and I cut the fabric pieces out, larger than the template pieces. I handed those back to the students, and they were to trace the template pieces onto the backside of the fabric. If you know anything about sewing, this can be tricky for people who have never sewn before (or never used a pattern). I had to physically show students how you TURN OVER the fabric (pattern side/good side DOWN), and then ALSO TURN OVER their template pieces (color pencil side DOWN) on top of the fabric. Then students trace the template and label the seams accordingly (also upside down/backwards). 5. Students at this point seem to really want to cut the excess fabric. Please remind them NOT TO CUT ANY FABRIC as they will need the extra fabric around the traced shape to hold the fabric together at the seam. 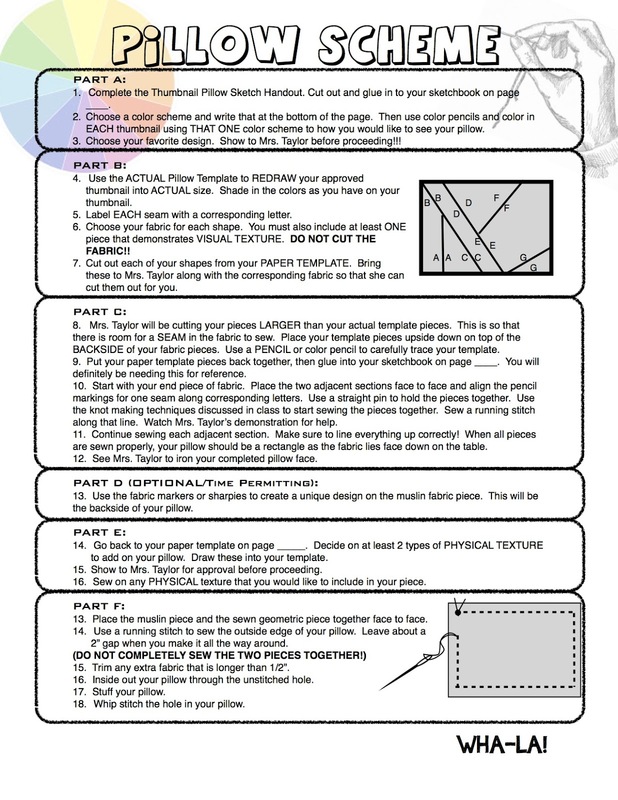 Students should then glue their paper template back together in their sketchbook- they will use this for reference as they sew! 7. After a class period of that, it was really great to watch as students helped each other. This project is/can be quite an attention sucker for the teacher. I was lucky enough to have two students who were way ahead of the others and I constantly would send students who needed help over to those two students. Then as time passed, I was able to expand that group of helpers as more and more students grew confident of the process. As students grasped the idea, I would then show them how to match up their fabrics (face to face)- two at a time, and sew the pieces together. Then on to the next pieces, and the next- use your template for reference! 8. 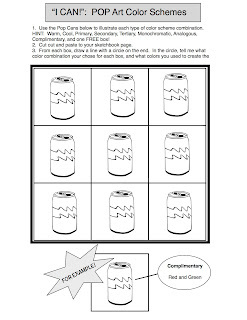 Once students are complete with the face of the pillow, I gave them an option to choose a t-shirt for the back, or a piece of plain muslin that they could draw on using fabric markers. 9. Now, at this point, some of my students ran out of time, so I did not make this part mandatory. This was my fault as I was trying to cram in the last two elements before school was out... we were behind due to my maternity leave. Anyway, the idea was to then sew on physical textures like fuzzy trim, buttons, sequins, beads, tassels, etc. 10. 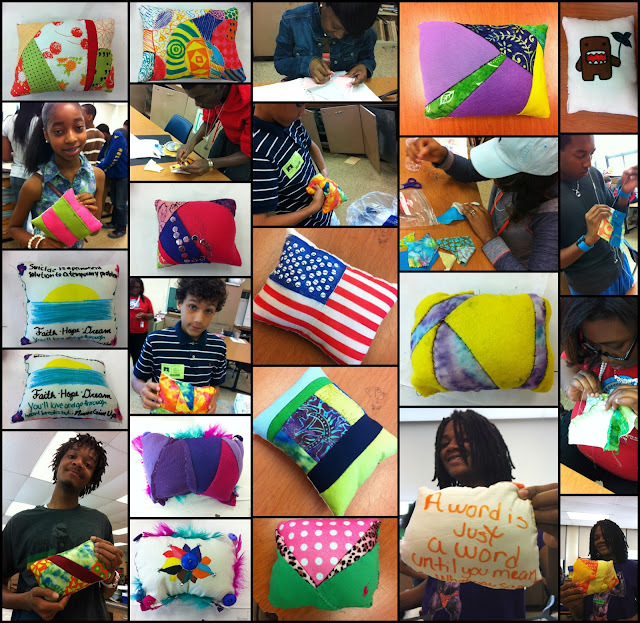 Lastly, students sew their back and front pieces of the pillow together, inside out the pillow, stuff it, and sew up the hole. I do have to say that students were incredibly proud of their pillows even if they turned out wonky. Here are some finished examples!